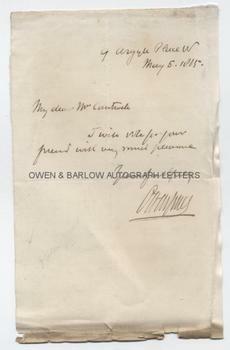 OWEN JONES autograph Letter Signed. British (Welsh) designer, architect, artist and writer. Superintendent of works at the Great Exhibition. ALS. 1p. 9 Argyle Place W. May 5th 1865. To Mr Cantwell. "I will vote for your friend with pleasure." 8vo. Approx 8 x 5 inches. Lacking integral blank leaf. Creased and frayed at edges with some browning to lower edge. Good. Owen Jones was one of the great designers of the 19th century. He studied Greek, Egyptian and Moorish design and Architecture and returned to the UK where he published influential books of his findings. For this purpose, he embraced the new processes of printing by the new process of chromolithography, a process which he helped to pioneer. He was appointed a superintendent of works for the Great Exhibition in 1851 and when the building was moved from Crystal Palace to Sydenham, Owen Jones carried out the decoration and fitting out of the new building. Owen Jones is perhaps best remembered for his influential 'The Grammar of Ornament' and the influential series of lectures and books on the subject, the result of which can be seen in the décor of the V&A museum. One of Jones's protégés was the designer Christopher Dresser. He designed wallpapers, tiles and other interior fittings. In addition to his work as a designer, Owen Jones was a very successful architect. His best known buildings included the Chrystal Palace at Sydenham and St James's Hall, Piccadilly. Autographs of Owen Jones are uncommon.